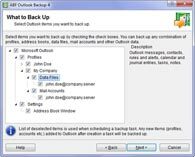 Outlook Backup - handy software to save and copy Microsoft Outlook. Program has a handy user interface, is compatible with all popular versions of Microsoft Outlook and enables to save, copy and synchronize all important data of Outlook mail program. Outlook Backup is an ideal combination of self-explanatory user interface and powerful functionality. Program can be easily used by beginners while advanced users will appreciate a whatnot of useful features. Outlook Backup enables to backup almost everything in Microsoft Outlook including emails, contacts, calendar and journal entries, mail accounts, tasks, notes, message rules, junk email lists, settings and signatures. Using Outlook Backup is easy as 123. Wizard-style interface will guide you through the all steps of backup or restore process. Outlook Backup is compatible with all popular versions of Microsoft Outlook, including Outlook 97, 98, 2000, 2002, 2003, 2007, 2010, 2013, 2016 and supports Microsoft Windows XP, Vista, 7, 8, 8.1, 10. All the backed up data is stored in one backup file which can be password protected. With Outlook Backup you can be sure all your important Outlook files are in one safe place. Outlook Backup enables you to backup your Outlook data on any location without any additional software. You are free to backup Outlook to local hard drive, burn the backup file to CD or DVD, save it to USB flash drive or store in remote computer using LAN. Having Outlook Backup you can easily transfer Outlook from one computer to another. Moreover, using self-extracting backup archive you don't even have to install the program on a second computer. Backup makes sense when it is made periodically. With Outlook Backup internal scheduler you can backup Outlook in appropriate time every day, week, month - whatever you wish! Outlook Backup automatically detects free space on the media you're going to backup and splits backup file on a several volumes (useful when backing up to CD or when the backup file is greater than critical system size). But you can also define volume size manually if you like. 3 easy steps to synchronize Microsoft Outlook. Common questions about Outlook PST files.